***quick note: re zip drives; the later Zip 100 Plus SCSI model will woorks with EPS-16 plus, but not with EPS Classic. WHY CHANGE A winning formula? This question must have been running through the collective Ensoniq mind as the company set about designing a 16-bit successor to their EPS sampler. After all, in many respects the EPS still hasn't been bettered in its sub-£2000 price range. Sophisticated sample looping facilities and sample split/layer keyboard textures, maximum 52.1kHz sampling rate, fixed-frequency sample playback, 24-bit internal processing, maximum 20-voice polyphony, full-blown synthesis capabilities, the ability to load samples off disk without interrupting a performance, a flexible and easy-to-use onboard sequencer and a polyphonic aftertouch keyboard aren't the signs of an instrument on its last legs. Ensoniq could have left the EPS alone and gone for a no-holds-barred - and much more expensive - stereo 16-bit machine, but clearly they felt it was more important to keep within the £1000-2000 price range which has served them so well up till now. At £1795, the EPS16 Plus is around £200 more expensive than its predecessor, but still a reasonable price when you consider that, in addition to the above features of the EPS, you're getting true 16-bit-linear mono sampling, double the EPS' onboard memory, and - perhaps most significantly of all - 24-bit effect processing. The only other sampler to include digital effects at present is Akai's S1000, which is considerably more expensive than the 16 Plus. Another feature new to Ensoniq's latest sampler is the Flashbank memory option, available in FB1 (512Kb) or FB2 (1Mb) versions. Sample data which has been saved to the Flashbank memory will be retained onboard the 16 Plus through power-down, making it readily available whenever the sampler is powered up. Unfortunately, Flashbank memory wasn't available on the review model, so I can't really say any more about it, but in theory it seems like a neat idea. 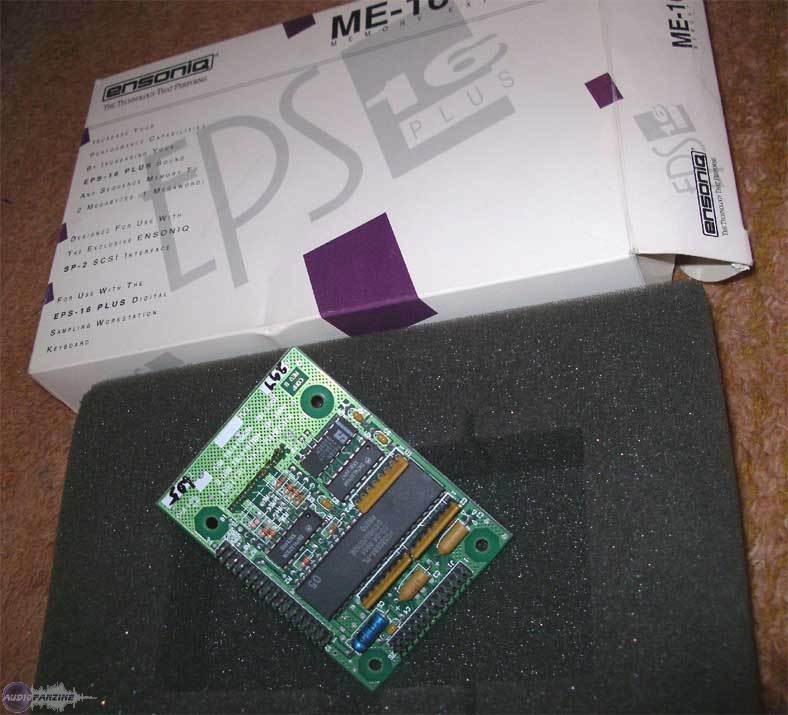 The EPS16 Plus comes fitted with 1Mb of RAM - upgradable to 2Mb with the optional ME16 Plus Memory Expander cartridge - which is shared dynamically between sample and sequence data. The standard memory is enough for 11.43 seconds of sampling at the maximum 44.6kHz sample rate, or about 160,000 notes of sequencer data. Other add-on options are the SP2 SCSI kit, which allows the 16 Plus to communicate with hard disk and CD ROM units (and which requires the ME16 memory expansion to be fitted) and the OEX6 Output Expander, which plugs into a socket on the sampler's rear panel and provides six dry audio outputs, grouped as three stereo pairs, in addition to the standard L/R stereo outputs. On the subject of audio outs, Ensoniq have included a stereo headphone output on the 16 Plus - something which was omitted from its predecessor. The rack-mount version of the EPS16 Plus, known logically enough as the EPS16R Plus, comes with the full 2Mb of memory and four stereo output pairs fitted as standard, and so doesn't require either the ME16 or OEX6 upgrades. THE EPS16 PLUS provides a choice of seven sample rates ranging from 11.2kHz-44.6kHz. That's a range of 46.25-11.42 seconds sample time with the standard 1Mb of memory. You'll probably want to mix 'n' match sample rates and reserve some memory for sequences, so in practice the total sample time will fall somewhere between. The inclusion of a Convert Sample Rate function (6.25kHz-48kHz) makes it possible to sample at a higher rate initially and then convert to a lower rate if necessary - and acceptable - later on, in order to conserve memory. An audition facility lets you play the resulting sample before deciding whether or not to keep it. Sampling is a straightforward process on the 16 Plus, as it is on the EPS. You press the Sample button, select an Instrument in response to the prompt (the 16 Plus automatically selects a new sample location), press the Enter/Yes button and you're in Level Detect mode with a peak-reading VU meter in the fluorescent display. At this stage the incoming sound is automatically routed via the 16 Plus' stereo outs for easy monitoring. The Amp indicator flashes in the display if the signal is clipping, and you can set a Threshold level (indicated by an asterisk in the display) with the Up and Down buttons. With the Left and Right buttons you can scroll to other screens which allow you to select the sample rate and a pre-trigger sample duration (10-20ms) together with either mic or line input level, view the remaining sample time for the selected sample rate, and adjust the cutoff point of the anti-aliasing filter. The 16 Plus automatically adjusts the latter to its optimum value whenever you change the sample rate, but if you sometimes want less than perfect samples then being able to change it yourself is useful. Pressing the Enter/Yes button while on the Level Detect screen activates sample mode, at which point the 16 Plus waits until the threshold is exceeded before starting to sample. It only stops sampling when the memory is full or when you press the Cancel/No button, whichever occurs first. Once the sample data has been processed, the 16 Plus asks you to play a Root Key for the sample (the note at which it'll be replayed at original pitch). At this point the sample is spread across the keyboard. To build up multisamples you keep going through the above process, assigning each sample to the appropriate Root Key. The 16 Plus automatically sets the splitpoint between two adjacent samples to be midway between their Root Keys, but you can adjust the range of each sample at any time. To redo a sample you go through the above process again, only selecting the sample you've just sampled into rather than a new sample. Once you have a sample in memory you can set its playback mode (forward no loop, backward no loop, loop forward, loop bidirection or loop and release) and adjust its Sample Start and End points and Loop Start and End points. These adjustments can be made while you play the sample, so it's easy to hear when they're wrong. A combination of coarse and fine adjust parameters and Up/Down and data slider controls allow you to move quickly or slowly through the sample data, while if Auto Loop Finding is enabled, the 16 Plus will automatically seek out zero crossing points for the loop start and end parameters as you scroll through the sample. Like the EPS, the 16 Plus offers a wealth of looping options should zero crossing points not be enough. As well as standard crossfade looping, you get Reverse Crossfade, Ensemble Crossfade, Bowtie Crossfade, Bidirectional Crossfade, Make Loop Longer and Synthesised Loop. You still have to locate what seem like decent loop points, but these options do their level best to create smooth loops for you. You can copy, delete, truncate, mix, merge and splice samples, and get the 16 Plus to create a square-wave sample for you. Loop Position allows you to adjust the Loop Start point while retaining the loop size, a function which is well suited to trying out a loop on different parts of a sampled break. Dynamic modulation of Sample Start, Loop Start and Loop End points can be programmed on an individual sample basis. Any one of 15 modulation sources - including mod wheel, velocity, aftertouch, keyboard tracking and random noise generator - can be used to dynamically control either Loop Position, Sample Start, Sample Start and Loop Position, Loop Start, Loop End, Loop Start-X or Transwave, with programmable modulation amount and range. Again, this can work well with sampled breaks, as a means of spontaneously expanding or contracting a loop or moving it around within a break which lasts several bars. LIKE THE EPS, the EPS16 Plus can route each of its samples through an all-digital Voice configuration which consists of an oscillator, two multi-mode filters, an LFO, three six-stage envelope generators "hard-wired'' to pitch, filter-cutoff and amplitude, and a sophisticated matrix modulation setup which allows oscillator pitch, LFO depth and speed, filter cutoff frequency, volume and pan position to be dynamically controlled from a range of 15 modulation sources which include the LFO, a random noise generator, velocity, aftertouch, envelopes one and two, the pitchbend and mod wheels and an external MIDI controller. The 16 Plus's polyphonic aftertouch keyboard comes into its own as a modulation source, allowing each note to provide its own degree of modulation. For instance, using polyphonic aftertouch to modulate pan position gives each active Voice independent movement within the stereo image. "The EPS16 Plus takes onboard effects processing into a new realm by allowing you to digitally resample an effected Wavesample within the instrument." The two filters within each Voice can be configured in any one of four ways: 3-pole low-pass + 1-pole low-pass, 2-pole low-pass + 2-pole low-pass (the classic 24dB/octave "analogue" filter response), 3-pole low-pass + 1-pole high-pass, and 2-pole low-pass + 2-pole high-pass. Disappointingly, Ensoniq haven't taken the opportunity to upgrade their filters with resonance control, but in other respects the Voice configuration offers abundant programming detail - for instance, separate envelope levels for soft and hard velocities (with the 16 Plus dynamically interpolating between the two according to the received velocity), random modulation of pitch, velocity control of envelope attack time, keyboard scaling of envelope times, envelope second-release time and level, an envelope mode (normal, cycle or repeat), LFO "humanise'' mode (randomly fluctuating LFO speed) and glide and legato performance modes. There's also plenty of modulation flexibility: for instance, you could use polyphonic aftertouch to modulate filter cutoff frequency and LFO speed while the LFO is modulating oscillator pitch and Voice pan position. THE EPS16 PLUS allows you to create up to eight pitch tables for each of its eight Instruments, and give each one a 12-character name. Each Layer within an Instrument (see Get Organised) can be played with either standard equal-temperament tuning, a fixed pitch across the entire note-range (middle C), or any one of the pitch tables assigned to that Instrument. Within a pitch table, every note from A0-C8 can be given its own coarse (semitone) and fine (cent) tunings. Fine tuning spans 0-99 cents (there are 100 cents to a semitone), and can be programmed to one-cent resolution. Although cent tuning is only positive-going, you can flatten a note by tuning it down a semitone and then sharpening it by the appropriate number of cents. The Extrapolate Pitch Table function allows you to quickly copy one interval or a series of intervals over the entire A0-C8 span, providing a quick means of creating, say, quarter-tone or reversed semitone scales. Finally, Pitch tables can be copied from one Instrument to another and Deleted. THE EPS16 PLUS can hold up to eight Instruments in its internal memory, each of which can consist of up to 127 Wavesamples (a Wavesample being a sample plus associated looping and synthesis parameters) spread across eight Layers. A Wavesample can be assigned to any range of notes, but only one Wavesample can be assigned to any one note within a Layer. To crossfade between Wavesamples over a note range, velocity-switch and velocity-crossfade between them or layer and overlap them, you need to assign them to different Layers. The 16 Plus gives you all the flexibility and versatility you could want when it comes to creating keyboard textures. Complete Instruments can be layered by double-clicking on the relevant Instrument/Track buttons, while split textures can be created by giving the Instruments appropriate note ranges. Further versatility is provided by the four Patches which can be programmed for each Instrument and selected using the front-panel Patch Select buttons, an Ensoniq SW5 Dual Footswitch or MIDI controller code 70. Each Patch can be programmed to play any selection of the eight Layers, so for instance you could set up one Patch to provide solo piano (Layer one) and another to provide layered piano and strings (Layers one and two). That's an obvious use, but in practice the Patches can be put to a wide range of uses. With all this textural sophistication, the inclusion of eight Performance Presets is welcome - these allow you to store and instantly recall selected internal and MIDI textures. THE EPS16 PLUS' onboard digital effects processing is the most substantial advance over its predecessor. Effects processing is provided by the Ensoniq Signal Processor (ESP) chip working in conjunction with a third-generation version of the company's Digital Oscillator Chip (DOC III), with a 16-bit DAC at the output stage. Of the four stereo busses on the 16 Plus, three are routed into the effects processor while the fourth (Aux) is routed to the rear-panel Output Expander socket and the OEX6, bypassing the effects. Each Voice can be assigned to one of these four busses. In most cases Buss 3 is reserved as a "dry" path to the main stereo outs. The EPS16 Plus offers a choice of 13 programmable Effects: Hall, 44kHz and Room Stereo Reverbs; Dual and 44kHz Delays; Chorus + Reverb; Phaser + Reverb; Flanger + Reverb; Rotary Speaker + Reverb; Chorus + Reverb + DDL; Compression + Distortion + Reverb; Distortion + Chorus + Reverb; and Wah + Distortion + Reverb. These provide all the quality and programming flexibility we've come to expect on Ensoniq's synthesisers since the advent of the VFX, including dynamic control of selected effect parameters (reverb wet/dry mix, flanger feedback amount and rotary speaker fast/slow switch) from a range of ten modulation sources which include mod wheel, channel aftertouch, velocity, incoming MIDI controller and the Patch Select buttons. Incidentally, the 44kHz effects reduce the standard 20-voice polyphony of the 16 Plus to a more modest 13 voices. With three busses into the effects processor you get quite considerable routing flexibility. For instance, with the Chorus + Reverb effect, you can use Buss 1 for Chorus and Reverb, Buss 2 for Reverb only, and Buss 3 as a dry output. Additionally, you can determine a reverb dry/wet mix for the chorussed signal and a reverb dry/wet mix for Buss 2. Chorus + Reverb + DDL gives you Chorus and Reverb on Buss 1, Reverb only on Buss 2, and DDL only on Buss 3, with a wet/dry mix on each buss. Selecting Rotate as the output buss assignment for a Voice causes the routing to cycle around Busses 1-3, so that each successive note played for that Voice is routed via a different buss. An interesting if rather mechanical feature; you could perhaps route every third note of a guitar part through distortion, or every third snare beat through digital delay. Running a looped break through a potentially extreme effect like Wah + Distortion + Reverb and editing effect parameters on the fly is something that's well worth investigating if you're into using breaks. Playing around with such parameters as reverb damping, compressor threshold, distortion gain, wah centre and range and the seriously dangerous system feedback can take you into the wilder realms of dub and industrial noise. "If you don't use the onboard sequencer, the 16 Plus is worth considering purely as a multitimbral sampler - you won't find a better instrument for under £2000." The EPS16 Plus takes onboard effects processing into a new realm by allowing you to resample an effected Wavesample. This is done internally, so the process remains entirely digital. You can set the destination Wavesample, the key at which the Wavesample will be resampled, the sample time and the output channel (Left or Right) that the 16 Plus will resample from. Once you've done this, pressing the Enter/Yes button activates the resampling process and you hear the Wavesample with effect being played by the 16 Plus. Once the process is finished, you can audition the new and resampled Wavesamples and discard the new one if it hasn't turned out right. If you keep the new Wavesample, it's automatically routed to Buss 3, presumably because this is often dry. Of course, there are practical limitations as soon as an effect becomes part of a sample. For one thing, it becomes fixed, unchanging - so you lose the sort of dynamic effect changes you can get by whacking up the feedback level on the phaser or dynamically modulating an effect parameter from, say, aftertouch. What's more, unless the sample is a one-shot you'll have to reloop it, which isn't always easy - and can make the effect sound more artificial. And the effect will change as you play a sample up and down the keyboard - DDL rate will become faster or slower, for instance. There again, resampling allows you to experiment with reversed effects, with or without reversing the actual sound (if you reverse the sound, resample it with the effect and then reverse the result, you get the effect but not the original sound reversed - and with reverb and DDL you get the effect before the sound). Another virtue of resampling with effect is that you can effect an effected sound, and so create sounds that you couldn't get by running a Wavesample "live" through the 16 Plus's effects processing. And you can resample as many times as you want without loss of quality, because the process is entirely within the digital domain. Resampling with effect is best for creating special effects (you can use effects processing to create weird sounds that you couldn't possibly get by standard synthesis means), giving individual sounds within a drumkit their own effect processing, and effecting a looped break (anything from a subtle touch of flanging or DDL to some wild tonal changes using the Wah + Distortion + Reverb effect). THE SEQUENCER ON the EPS16 Plus adopts the same format as that on the EPS: 80 eight-track sequences which can be chained together to form one Song in memory, with a further eight Song tracks which run parallel to the Sequence tracks and allow you to record for the entire length of the Song chain. Each Sequence can be up to 999 bars long, while a Song can consist of up to 99 steps, each of which can have up to 99 repetitions. Song tracks can only be recorded once you've set up a Song chain, while Sequence tracks can't be recorded in the context of Song tracks. Although literally speaking there are 16 tracks, the Sequence and Song tracks aren't wholly independent of one another. For one thing, Instruments 1-8 are allocated both to Sequence tracks 1-8 and Song tracks 1-8. This means in turn that controller data such as pitchbend and sustain pedal recorded into a Song track will also affect the corresponding Sequence track, and vice versa - as will track mix and track pan data. Another practical limitation is that internal/MIDI status is defined per Instrument rather than per track, as are MIDI transmit and receive channels. More often than not, then, you'll want to record into either a Sequence track or the equivalent Song track, in which case you've effectively got an eight-track sequencer with the balance of Sequence and Song tracks decided by you. Each Sequence can be given its own time signature and tempo. The length of the first track to be recorded within a Sequence defines the length of the Sequence, but you can subsequently lengthen or shorten a Sequence. Track record mode can be set to Replace, Add or Looped (the latter providing drum machine-style recording). You can Goto any bar within a Sequence once the initial track has been recorded, and start recording from that point; it's also possible to manually drop in at any point in a track. You can record a track from the 16 Plus' keyboard and/or an external MIDI source. Apparently the next version software will offer multitrack recording via incoming MIDI, together with the ability to load Instruments while a Sequence or Song is playing. In traditional Ensoniq fashion, the 16 Plus allows you to audition old and new versions of a track before deciding which to keep. As well as providing a quick means of erasing an unsuccessful take, this allows you to recall a previous take. Track mix (volume) and pan data can be recorded dynamically into a track by selecting the appropriate parameter field and then adjusting the value using the data slider and the Up/Down buttons... Patch changes can be recorded into a track by holding down the appropriate Instrument/Track button, tapping in the patch number on the numeric keypad and then releasing the Instrument/Track button at the appropriate point in the Sequence or Song. Track editing functions include quantising, copying, erasing, merging, transposition, time-shifting, event-scaling, and erasing and copying of specific types of event. There's also detailed and precise event editing to clock resolution (the EPS16 Plus has 96ppqn resolution to the EPS' 48ppqn). In addition to selecting a Sequence and a number of repeats for each step in the Song chain, you can define the status of each Sequence track as Muted, Playing or Transposed, and program a single transposition amount (± one octave in semitone steps) which applies to all Transposed tracks within the step. Although the Song tracks are provided for extended recording, you can Goto any Song step and begin recording from that point, so it's possible to record on a step-by-step basis. Real-time muting of Sequence and Song tracks during playback is possible from dedicated screens. You select a Track by pressing the relevant Instrument/Track button, then use the Up and Down buttons to set the track to M(ute) or P(lay). Being able to mute and unmute tracks simply by successive presses of the Instrument buttons would have been preferable. Also, it's a shame that the 16 Plus can't record real-time track mutes - surely no more difficult a task than recording track mix and pan data. 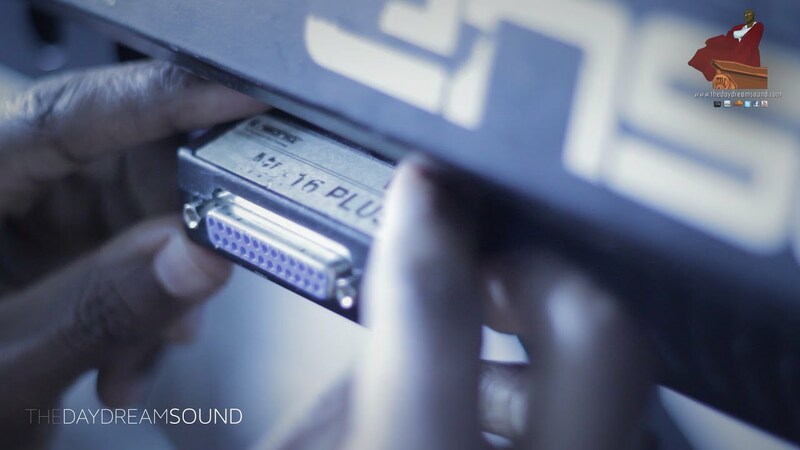 THE EPS16 PLUS is a powerful, sophisticated, versatile, well-thought-out sampler with a great deal of depth to it - which is no more than we've come to expect from Ensoniq. Sample quality is excellent, while the fixed-rate sample playback ensures that samples transposed down over several octaves remain undistorted. The usual musician-friendly onboard sequencer does no harm to Ensoniq's workstation credentials, though to my mind the company should have taken the opportunity to upgrade the 16 Plus to 16 Instruments and truly independent Sequence and Song tracks. Even if you don't want to use the onboard sequencer, the 16 Plus is well worth considering purely as a multitimbral sampler - you won't find a better instrument for under £2000. Above all it's the 16 Plus's onboard effects processing and its Resample-with-effect function which puts it in a class of its own - and most decidedly distinguishes it from its predecessor. Ensoniq show yet again that they're a company to be taken very seriously - not least by their Japanese competitors. Prices EPS16 Plus, £1795; EPS 16R Plus, £1825. Both prices include VAT.